comment Erleben Sie den Grand Canyon auf einer unbeschreiblichen Art und Weise. Your state-of-the-art chopper is designed from the ground up for sightseeing and features a nearly 180-degree field of view, passenger-to-pilot communications, and choreographed music. 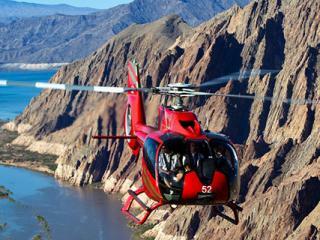 You will feel awe and exhilaration as you fly like a bird on the most extensive helicopter tour there is from Boulder City. Don't forget your camera! Reservierungen sind nötig. Bitte teilen Sie uns bei Ihrer Buchung Ihr Wunschdatum mit. Der Helikopter hat strenge Gewichtsvorgaben. Passagiere über 125kg benötigen zwei Sitze und müssen beim Check in eine Gebühr von 100$ entrichten. Passagiere werden beim Check-in gewogen. Hoteltransfer von allen Hotels in der Nähe der "Strip" und Downtown Gegend von Las Vegas. Abflug von Boulder City Airport. Der Tranfer zum Flughafen kann bis zu 60 Minuten dauern. Beim Abflug muss ein Personalausweis oder Reisepass vorgezeigt werden. Der Flug dauert etwa 70 Minuten. Layered clothing is recommended through the months of March to September, and winter clothing should be worn from October to mid-March.. Don’t forget your camera! Cameras and phones are allowed and encouraged but please be aware that the use of "Selfie Sticks" and extending camera poles is strictly prohibited in and around the aircraft. Finally, all passengers booked on this tour must have government issued forms of identification.